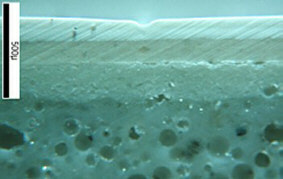 To read our article on carbon fibre failures in the marine environment, please follow this link. We work many clients within the marine industry, both in examination of failures, inspections and assisting in the development of new products. Our clients include designers, marine surveyors and manufacturers and hence have a wealth of experience of engineering in the marine environment. This page contains some case studies which should give a flavour of some of the areas that we have been involved in. Corrosion is a problem which is extremely common in components exposed to a marine environment and this particular failure illustrates the problems that can ensue when connecting two dissimilar metals. This failure arose in the sea water cooling system in a large yacht. 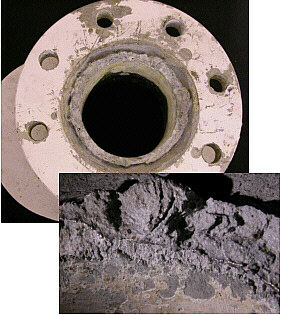 In one pipe, the weld connecting an aluminium pipe and flange corroded heavily. We undertook compositional analysis of the weld and parent metal to determine whether there were any elements within the materials that would lower its resistance to corrosion. It later became apparent that the bolts through the flange were made from 316 stainless steel, which is higher in the galvanic series than aluminium and so if connected to the aluminium electrically, would result in galvanic corrosion. We were then able to make recommendations as to how to isolate the bolts and flange and so avoid further corrosion. Paints and coatings are used to improve the corrosion or wear resistance of structures, and are also to enhance aesthetics. The examination indicated that remedial work has been applied to paint where the surface had been inappropriately keyed and that there may have been solvents trapped in the paints leading to blistering. Glass reinforced plastic (GRP) is commonly used in boat construction and so we have come across many cases where problems have arisen. In this case, ripples were forming in the GRP outer skin of a sandwich panel hull. 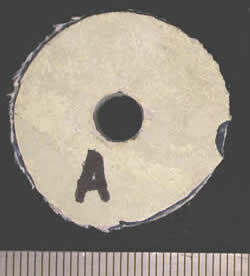 The expanded foam coring was scored to allow it to be bent to shape, and epoxy resin had leached into the slits. In this case we undertook thermal modeling to show that the temperatures reached in the hull in direct sunlight exceeded the glass transition temperature of the resin. At this temperature, the resin becomes soft and pliable. Laboratory tests suggested that the resin in the face sheets had not been correctly mixed, and so when the hull became hot, the resin in the core slits expanded, deforming the partially softened face sheets. As these heating and cooling cycles progressed, the face sheets continued to cure, locking the deformations in place . Most manufacturers will work to a design specification that details the lay up construction including the type of glass matting, the number of layers and the orientation. In cases where the hull is not performing correctly, where cracks appear or unwanted flexing occurs it may be due to errors in the manufacturing process. We can analyse simple core samples taken from the hull and determine the exact lay up construction and compare this with the design specification. The photos below demonstrate a typical analysis. In several cases this has led to manufacturers supplying new hulls to their clients. We work closely with Cowes Marine Cluster and feel it is important to foster links with local businesses. If you would like to find out more about this venture, please click here.